Being a leading firm in this industry, we are offering a high quality range of Filter Bag Cages. We offer a wide range of Strainer Bags for Oil. These filter bags are manufactured using premium grade fabrics sourced from reliable vendors. The entire assortment of Strainer bags for oil are manufactured as per GMP norms. Being a leader in the industry, we are engaged in offering a qualitative range of Filter Bag Cages to our clients. 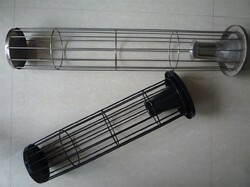 We manufacture and supply a wide range of Filter Cage. These are manufactured by high grade of raw material in order to increase the durability of the cage. These are made in galvanized steel, mild steel and stainless steel and are available in different types as flange type, u type, groove type etc. From our wide consignment, we are affianced in supplying Batching Plant Filter. We offer a quality range of pulse jet filter bags from a sophisticated woven needle felt. This material provides high performance and strength to these bags. We have attained a notable position in the market by offering the finest quality array of Bag Supporting Cages. 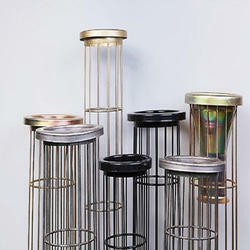 We are leading manufacturer , supplier and exporter are Dust Collector Cages are known for their performance and quality. Made of optimum quality materials like needle felt, these cages are processed as per industrial norms. We are one of the prominent manufacturers of Filter Bag Cages of India. Our Filter Bag Cages are being highly preferred for various industrial applications and commercial applications. We manufacture these Nonwoven Fabric Bags using the superior graded raw materials and in line with the exact specifications of the clients. Our range includes Filter Bag Cages that are widely used as a pollution control medium. It is highly demanded in the market due to its desirable flow rate, good retention properties etc.